Blacksheep Bingo is a chance for fiber crafters who blog or are on ravelry to meet each other in person. 1) Each participant must have a Ravelry id. 2) You can either be a player, a square or both. If you are a square you’ll display the Blacksheep Bingo logo while at the event. If you are a player, you will get your bingo cards a week before so you can check out who you will be looking for. If someone isn’t wearing their logo, but you know they are on your card, take this as a sign that they may need a bingo breather. 3) Play space will be limited to the fair grounds public space. Please avoid tent spaces and camping. Depending on how many people we get together this could be very intrusive to people who are camping. However, the different buildings on the fairgrounds are all game! 5) All participants will be put in a drawing for the prizes. The time/place of the drawing will be announced later. You won’t need to be present to win, but we will have the prizes to pass out at that time. Overall, this is a chance for us to meet each other and share a great fiber gathering! If you would like to donate a prize, please fill out this form. We’d love to have as many participants as possible, so it’s time to get the word out! Post on your blogs, message other people who you know will be going to Black Sheep Gathering. The more people there are, the more fun this will be! 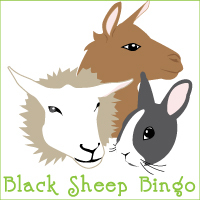 Here’s the Blacksheep Bingo Logo! Please save them to your server and show them off!